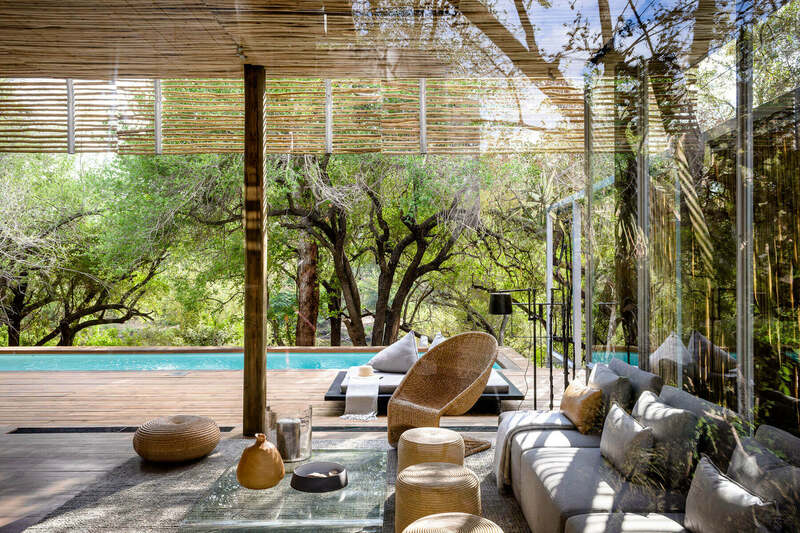 As if dropped by chance, Singita Lebombo Lodge is a contemporary jewel amidst acres of unrelenting natural beauty. Spreading over an impressive 19,485 square kilometres, Kruger National park certainly contains multitudes as the diverse natural habitats encourage all manner of game and industrious flora. In this swatch of land, boulders, rugged cliffs and mature trees buttress your accommodations while the view gives way to the confluence of the Sweni and N’wanesti Rivers. The drama of the land—not to mention your lodgings—will make even the most fastidious person wax poetic. Those who crave the remote locales of the world (and the spectacular wildlife that accompanies it), but don’t want to compromise on comfort and style will certainly find something to celebrate in this singular setting. Rugged boulders and cliffs, mature trees and the flowing N’Wanetsi River. Most Memorable Moment? Sipping sundowners on the rooftop terrace as Kruger Park drifts to sleep (and in some ways comes alive!) is life-changing. From the personalized service to the totally customized food choices offered by the chef at every meal to the gorgeous (and sometimes outdoor!) sleeping arrangements... all of it was just outstanding. Parked near the eastern boundary of Kruger National Park, Singita Lebombo Lodge is accessible by both air and land. Scheduled flights and private charters all arrive to the Satara airstrip and require a further 45-minute drive to the lodge. Flight times from Johannesburg are about 1 hour and 30 minutes. Flights arriving from Nelspruit are about 45 minutes. By land the duration of the drive from Johannesburg is about 8 hours. Arriving from Nelspruit cuts the drive down to 4 hours. Inspired by eagles’ nests, 13 loft-style suites are embedded into the face of the cliff and gaze toward the river bank. 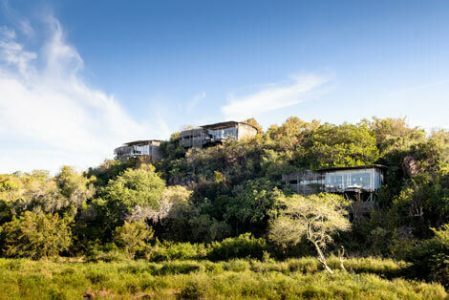 While they may be mimicking natural habitats, these romantic hideaways are anything but rustic: glass-walled suites give way to elevated wooden viewing decks, detailed bathrooms and sophisticated style. The two remaining suites, which can be converted into a private villa, sit on the riverbank. Become one with the landscape in these light-filled abodes. This open-plan layout includes two bedrooms and features two showers—one inside and one outside. Tall glass doors slide open to a private deck with a daybed. Looking for a little more privacy? Low on the river bank sit two 2-bedroom suites—each with a private pool—with the option to be ceremoniously linked together, by an additional shared pool, to form a four-bedroom lodging. Fully staffed with an open-plan kitchen and boma, it’s not hyperbolic to say, all needs will be seamlessly met. Looking to extend your adventure? 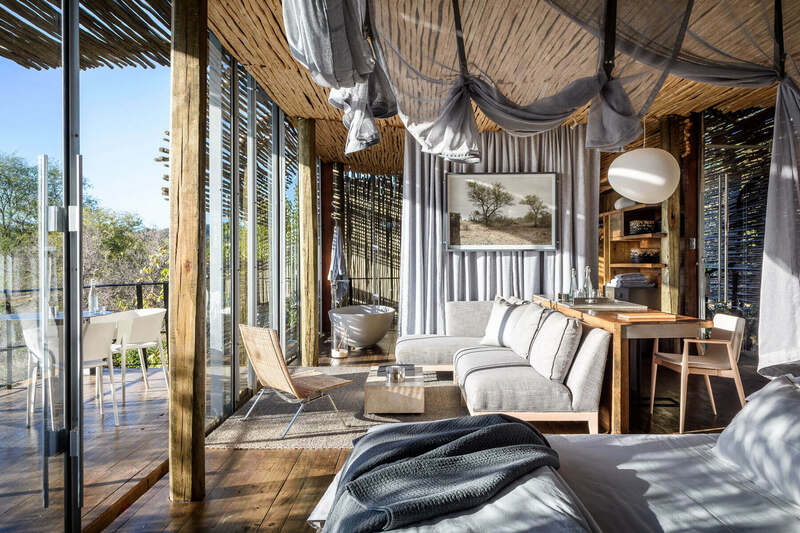 Discover a few ways to weave Singita Lebombo Lodge into an even grander journey.